A brushless DC (BLDC) motor is highly reliable since it does not have any brushes to wear out and replace, brushless design for high speeds, long life and high power density. ATO has a wide selection of high quality and good performance brushless DC motors to meet your specific needs. They come in different size to provide you the right torque for your application. The price of our brushless DC motors listed in the form are reasonable and for reference only. If you want more information, please go to ATO brushless DC motors products page. Note: The prices in the table are just for your reference. If you want to get the latest quotation, please contact us now. Generally, it's cheaper than the price in the table. 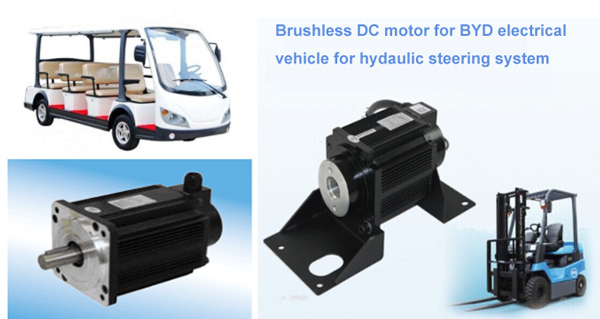 Brushless DC motors are applied to replace the traditional brush motors in forklifts, sweeping cars, sightseeing cars, electric buses and other battery cars, the motor capacity can be reduced by a level, the volume reduced by 2/3, the weight reduced by half and the battery capacity can be doubled, which gives the motor high climbing power with a starting torque up to 400%, you can start in the slope. DC brushless motors do not require to be maintained and repaired, and its operating efficiency is about 30% higher than brush DC motors, while what is more valuable is that it uses square wave drive (intermittent power), the current duty cycle is very low (unlike brush DC motors consuming continuous current), thus providing the time for the lead-acid battery to repair the electrode, thus extending the battery capacity by about 30% compared to a DC brush motor, that is, using a DC brushless motor to drive the endurance than a brush DC motor can be doubled or so.